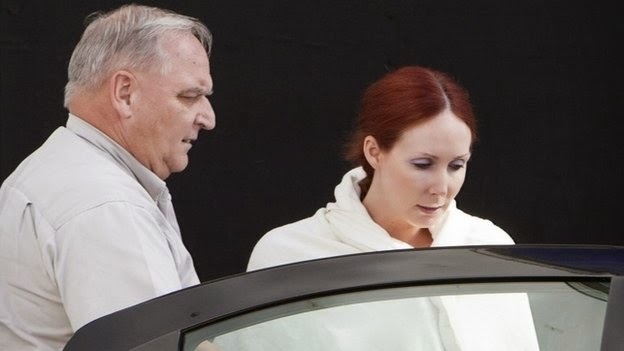 An actress who posted ricin-laced letters to US President Barack Obama and New York Mayor Michael Bloomberg has been given an 18-year prison term. Shannon Richardson, 36, from Texas, had accused her estranged husband Nathaniel of sending the three poisoned letters in an apparent attempt to frame him. "I never intended for anybody to be hurt," she told the court. She pleaded guilty in December to the charge of possessing and producing a biological toxin. A federal judge gave her the maximum sentence under that plea deal and ordered her to pay restitution of about $367,000 (£214,000). Richardson, a mother of six, has played small roles in The Vampire Diaries and The Walking Dead, according to IMDB. Prosecutors say that after ordering the ingredients online, she made the ricin and then posted three letters before going to police and claiming her estranged husband was to blame. According to a federal indictment, one letter to Mr Obama read, exactly as she wrote it: "What's in this letter is nothing compared to what ive got in store for you mr president." Another letter received by Mr Bloomberg, a gun control advocate, contained a threat to "shoot in the face" anyone who came for the sender's guns. A third ricin-laced letter was opened by Mark Glaze, director of Mayors Against Illegal Guns, a gun control advocacy group founded by Mr Bloomberg. In asking the judge for leniency on Wednesday, Richardson apologised and said: "I'm not a bad person. I don't have it in me to hurt anyone." She asked for "mercy and compassion" and said she'd already been punished by being parted from her six children.